Orangutans are the world’s largest tree-dwelling animals. In the Malay language, orangutan means “man of the forest.” Considering they share 96.4 percent of their genes with humans, the term is uncannily accurate. 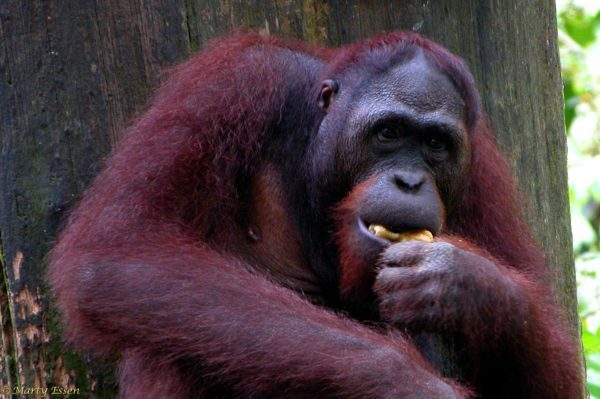 The red apes live only in Borneo and on the Indonesian island of Sumatra. At the time of our expedition, researchers were estimating that the total population of wild orangutans had declined by 50 percent since the 1980s. With a current population of just fifteen thousand, they could become extinct within the next ten to thirty years (the IUCN classifies them as an “endangered species”). The primary factors contributing to their demise are poaching, illegal pet trade, and habitat destruction. Malaysia has taken steps to protect orangutans and, to a lesser extent, so has Indonesia, but neither country is doing enough.